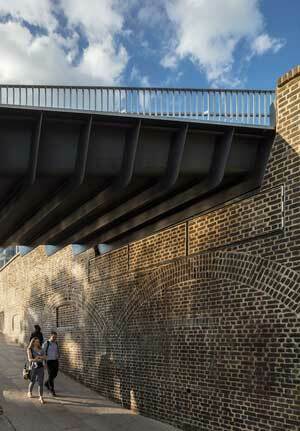 Client: King’s Cross Central Limited PartnershipDesigned for cyclists and pedestrians to cross from Camley Street into King’s Cross Central, the Somers Town Bridge is a landmark redevelopment project. One of the planning design drivers was that this should be a ‘green bridge’. This was achieved by taking minimum material use to the extreme which would become the defining feature of the architectural simplicity. With the use of steel, and its high recycled material content, this has resulted in a low carbon solution. Secondly, the history of the area is one of heavy industrial use and the bridge provides the opportunity to remediate the contaminated land and replace it with parkland of higher biodiversity value. 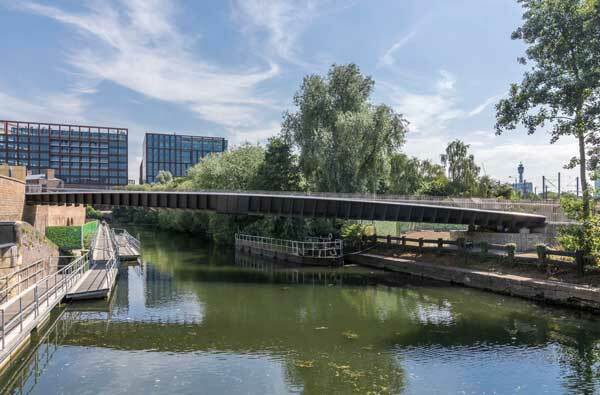 According to the project team the use of steel construction offered two significant benefits: Firstly, offsite fabrication and single piece lifting was required to avoid disruptive construction methods on this heavily trafficked section of canal. This also enabled the offsite and on-site construction activities to run in parallel with associated programme benefits. Secondly, the eastern abutment was integrated inside existing Victorian brick arches. A lightweight deck allowed the use of small diameter piles and a low headroom piling rig that could operate inside the arches. This had the additional benefit to maximise retail space within the arch space. The bridge was optimised to meet the architect’s aspiration for a slender structure that would minimise the shade on the canal. Non-linear analysis of the slender deck ensured that the slenderness would not compromise safety and would provide maximum comfort for users of the bridge. Particular care was placed on satisfying the user comfort criteria, which led to the use of bespoke tuned mass dampers at mid-span to suppress vertical and torsional dynamic modes of the deck.